Hot off the easel, the latest work by Tom Miller has just been delivered to It’s All 2 Much Art Gallery. This one is just as detailed as his last work “Tom” which was snapped up by an astute collector from the Midlands. 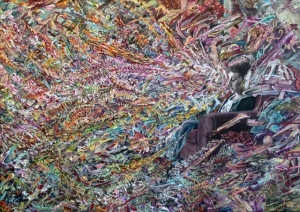 Entitled “Energy”, the painting depicts model ‘Tom’ dozing in his armchair while his subconscience is bombarded by the sights and sounds within his sitting room. For more details, visit the product page here.